Irrigating fresh fruit orchards with less than 100% evapotranspiration (ET) can lead to problems with fruit quality and tree health. Nevertheless, research has shown that certain stages of growth are less sensitive to water stress than other stages. Therefore, there are periods during the season when reduced irrigation will generally be less harmful. With hundreds of different varieties, many soil types and numerous irrigation systems, it is difficult to develop generalized drought strategies to fit every situation. However, the following guidelines should help an orchard manager design a program for his/her particular situation. Fresh market stone fruit varieties are harvested anywhere from early May to October in California, with the majority coming off in June, July and August. For the purposes of irrigation management, those picked in May and June will be referred to as early varieties. Those harvested in July and later will be termed late varieties. The fruit of all varieties grow rapidly in early spring (Stage I). Early varieties continue to enlarge steadily until harvest. However, late varieties have a period of slow enlargement (Stage II) right after pit hardening (generally early May). They then enlarge rapidly again for the last 4 to 6 weeks before harvest (Stage III). It is not recommended to stress trees before harvest in early varieties. First, ET tends to be relatively low early in the season, so not much irrigation water is needed. Second, large fruit size is critical in the early market (Lopez et al., 2007) and any water stress will reduce fruit growth. Instead, the period after harvest offers the potential for saving substantial amounts of irrigation water. 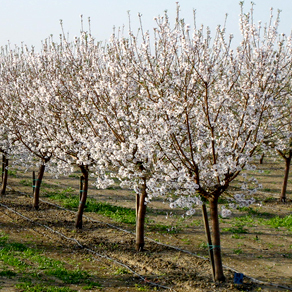 In a deep soil under flood irrigation, peach trees have been shown to survive and remain productive for four consecutive years with no irrigation between June and October (Larson et al., 1988; Johnson et al., 1992). However, in many situations this would be too extreme an approach and problems such as defoliation, scaffold sunburn, gumming and increased mite damage would likely occur. If water is available, a better strategy would be to cut back to 40 to 80% ET for the remainder of the season (Johnson & Phene, 2008). Some of the problems mentioned above may still develop so trees should be monitored regularly. The pressure chamber (UCDavis Fruit & Nut Center) is a useful tool to help with this monitoring. Research in California and in Israel has suggested serious problems can be avoided if the stem water potential (as measured with a pressure chamber) is kept above (less negative) than a threshold of -20 bars. Water stress in late summer also interferes with flower bud development and can cause fruit defects the following year. Fruit doubles (see photos), deep sutures (see photos), split pits and smaller fruit size can all result from water stress (Handley & Johnson, 2000; Johnson & Phene, 2008). The critical timing for minimizing these disorders appears to be late August to early September when carpels (fruit) are forming in the flower buds. Therefore, a drought strategy of extra irrigations from early August through early September, even at the expense of reduced irrigations during June and July, might be advisable for some varieties (Johnson et al., 1992; Johnson & Phene, 2008). Different varieties differ greatly in their propensity to succumb to these disorders. Fruit doubles and deep sutures are seldom a problem in plum varieties (Johnson et al., 1994a). After harvest of late varieties, irrigation can be reduced substantially or even eliminated in some cases without major detrimental effects. Late varieties don't generally have as many problems with double fruit and deep sutures the year after the trees have been water stressed. The trees should still be monitored regularly during the rest of the season as it is possible to have mite flare-ups, defoliation, gumming, shoot dieback and scaffold sunburn. As with early varieties, the pressure chamber (UCDavis Fruit & Nut Center) is a valuable tool to help monitor the degree of stress, and a "danger" threshold of -20 bars should still hold for most situations. In a more severe drought situation it may be necessary to reduce irrigation with fruit on the tree. This is a more challenging problem. First, fruit size will invariably be reduced with any reduced irrigation strategy (Johnson et al., 1994b). Fruit soluble solids content will often be increased (Crisosto et al., 1994), but always at the expense of fruit size. Research has shown that fruit size is more sensitive to stress during Stage III than during Stage II of fruit growth. Therefore, to minimize the detrimental effects of stress, the recommended drought strategy is to reduce applied water during Stage II but restore full irrigation during the final 4 to 6 week period before harvest. In many California soils this strategy can be difficult to implement as water infiltration is greatly reduced after a period of soil drying (Girona et al., 1993). If little or no irrigation water is allocated to the orchard, the goal may be to just keep the trees alive until more abundant water is available. A severe treatment of cutting the scaffolds back almost to the trunk (dehorning) has been shown to work in Washington (Proebsting, 1980) and California. We were able to keep trees alive with no irrigations during the season with this strategy. Winter rains provided some initial soil moisture and the trees put on several feet of new growth. After a year or two of normal irrigation dehorned trees can be reformed into standard looking trees. Crisosto, Carlos H., Johnson, R. Scott, Luza, Juvenal G., and Crisosto, Gayle M. 1994. Irrigation Regimes Affect Fruit Soluble Solids Concentration and Rate of Water Loss of â€œOâ€?Henry Peaches. HortScience 29(10):1169-1171. Girona, J., Mata, M. Goldhamer, D.A., Johnson, R.S., and T.M. DeJong. 1993. Patterns of Soil and Tree Water Status and Leaf Functioning during Regulated Deficit Irrigation Scheduling in Peach. J. Amer. Soc. Hort. Sci. 1185(5):580-586. Handley, Dale F., and R. Scott Johnson. 2000. Late Summer Irrigation of Water-stressed Peach Trees Reduces Fruit Doubles and Deep Sutures. HortScience 35(4): 771. Johnson, R.S., Handley, D.F., and T.M. DeJong. 1992. Long-term Response of Early Maturing Peach Trees to Postharvest Water Deficits. . J. American Soc. Hort. Science, 117(6):881-886. Johnson, R. Scott, Handley, D.F., and K.R. Day. 1994a. Postharvest water stress of an early maturing plum. Journal of Horticultural Science (1994) 69(6) 1035-1041. Water Use and Water Management of Mid to Late Season Stone Fruit. 1994b. CTFA Annual Report. Johnson, R.S. and B.C. Phene. 2008. Fruit Quality Disorders in an Early Maturing Peach Cultivar Caused by Postharvest Water Stress. Proceedings of Vth IS on Irrigation of Hort. Crops, Acta Hort 792, ISHS. Larson, K.D., DeJong, T.M., and R.S. Johnson. 1988. Phsiological and Growth Response of Mature Peach Trees to Postharvest Water Stress. J. American Soc. Hort. Science, 113(3):296-300. Lopez, Geraldo, Johnson, R. Scott, and Theodore M. DeJong. 2007. High spring temperatures decrease peach fruit size. California Agriculture January-March. Proebsting, E.L. and J.E. Middleton. 1980. The Behavior of Peach and Pear Trees Under Extreme Drought Stress. J. Amer. Soc. Hort. Sci. 105(3):380-385.